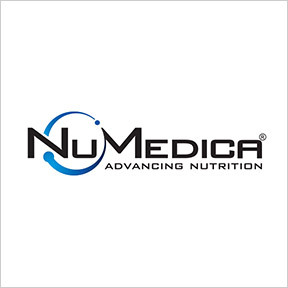 NuMedica’s founding principles are based on one objective: To improve overall health and quality of life by innovating, developing and manufacturing superior quality professional nutraceutical formulas. NuMedica® defines innovation as the successful implementation of ideas to achieve physiological balance. As such, their synergistic, science-based nutritional formulations are carefully designed with high quality, bioavailable ingredients in support of improved patient outcomes and measurable results. Their nutritional supplements are manufactured to meet or exceed strict cGMP quality standards. ImmunoG PRP™ Powder: This natural whole food product contains pure bovine colostrum high in Proline-Rich Polypeptides (PRPs), as well as immunoglobulins IgG, IgD, IgE, and IgM. It supplies protein and immune and growth factors, as well as vitamins and minerals in support of health and vitality. This formula is low heat processed to retain maximum biological activity. Free of hormones, antibiotics, gluten, eggs, soy, tree nuts, peanuts and rBST. No artificial colors, sweeteners or preservatives. DIM Estro™: Designed to support healthy estrogen metabolism for both men and women, this formula provides an advanced metabolite found in cruciferous vegetables. The addition of BioPerine® enhances the bioavailability, extent of absorption and serum concentration of the bioactive curcuminoids. Free of gluten, milk, eggs, fish, shellfish, tree nuts, peanuts, wheat and soy. Vegetarian formulation. Power Greens® Chocolate: This convenient, energizing powdered formula provides certified organic, whole food plant extracts. Proprietary blends of fruits, vegetables, antioxidants, fiber, digestive enzymes, and dairy-free probiotics supply natural vitamins, ionic trace minerals, and phytonutrients in support of overall wellness. Free of gluten, milk, eggs, animal products, preservatives and artificial ingredients. Vegetarian formulation. Natural chocolate flavoring. Additional flavors include Mint, Strawberry Kiwi, Berry and Expresso. Osteo Vegan™: This popular professional grade vegan bone support formula provides certified organic whole food calcium and clinically effective plant-derived vitamin D, as well as over 70 naturally occurring trace minerals and phytonutrients. Free of gluten, milk, eggs, fish, shellfish, tree nuts, peanuts, wheat and soy. Vegetarian formulation. Methyl-Plex B™: This top selling comprehensive formula is designed to support optimal cardiovascular health, methylation, and healthy homocysteine levels. Free of gluten, soy, wheat, fish, shellfish, tree nuts and peanuts. Vegetarian formulation. Glutenza™: This gluten pulverizing formula is uniquely designed with proprietary blends of powerful enzymes, prebiotics and probiotics that break down hidden gluten proteins in gluten-free diets. Additionally, the highly specialized prebiotic PreForPro™ supports a healthy intestinal tract by promoting beneficial bacteria in the intestines, which play a critical role in the breakdown of gluten and other proteins. This entry was posted in Home and tagged DIM Estro, Glutenza™, ImmunoG PRP™ Powder, Methyl-Plex B, NuMedica, Osteo Vegan, Power Greens® Chocolate, Professional Supplement Center, Vitamins and supplements, www.professionalsupplementcenter.com. Bookmark the permalink.